With Bosch’s prototype driverless cars unveiled and ready to hit the road, it looks like the future is here. Australia’s first driverless car is lauded by many and seen as a fantastic way to curb road rage, congestion and road trauma. The cars are not yet ready to go into mass production and you will have to wait till 2020 to finally own one. Scroll down to know everything about the first self-driving car in Australia. 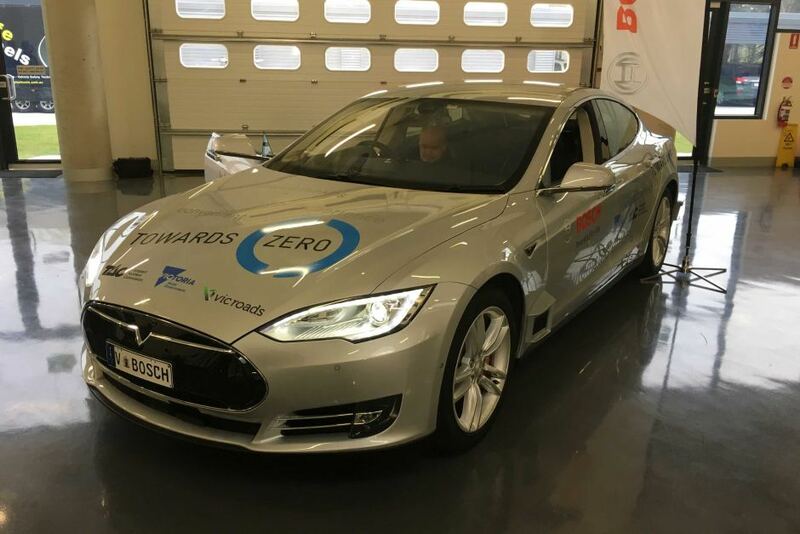 The driverless car has been developed, designed and built with the collaboration of VicRoads and Transport Accident Commission (TAC) with Bosch, the German multinational. The project has received great impetus and encouragement from the Victorian Government’s $1.2 million investment. The prototype took over 9 months and 85 people to design and develop, and the exterior resembles a Tesla model S Electric sedan, but under the hood, it is all new. The driverless car includes high-resolution GPS, 6 radars, 6 LIDARs and sensors. The car is built to level 4 autonomy, which is one step below a fully driverless car. Therefore, the car will still require a driver behind the wheels, but it is designed to navigate the roads with or without any inputs from the driver. The in-built sensors help to detect and avoid external road hazards, such as pedestrians and other vehicles. The car is equipped with automatic driver detection and configuration in accordance to the preference of the driver, such as steering wheel configuration and the position of the seat. Australia’s first driverless car features internal cameras monitoring the driver, as well as, a stereo video camera helping the car to operate with a complete picture of what is going on the road and around the car. The computer program, design and configuration of the car is considered 10 years ahead of its time. The developers feel that before the car goes into mass production, it needs to be tested on real roads. The trial is slated to begin from 2019. According to the President of Bosch, Australian roads have the proper infrastructure and are ready for driverless cars. The Victorian Road Minister is of the opinion that the technology of the autonomous car is the answer for reducing serious road injuries and death on Victorian roads. Additionally, the proper development of automated vehicle technologies is crucial to the development of the vehicle component manufacturing jobs in the state, in the future. Sydney Car Buyer is among the few to test the new driverless car. The major aim of this innovative project is to build vehicles that are safer than human-driven cars. Research suggests that many road accidents can be attributed to human error. A driver may get distracted by a phone call or a work email and such careless accidents can be avoided by introducing technologically advanced driverless cars. Australia’s first driverless car is the front-runner in the automated vehicle technology and it is developed by local engineers of Melbourne. Embrace the future of driving and look forward to a future free of deaths and serious road injuries.